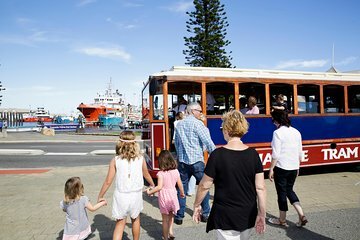 When booking, upgrade to one of two additional options to enhance your Fremantle sightseeing tour with a little more history or riverfront scenery. On a Swan River lunch cruise, enjoy views of Perth from the water while feasting on a buffet lunch of seafood, hot dishes and a glass of wine or beer. Or, select admission to the Fremantle Prison, part of the Australian Convict Sites UNESCO World Heritage site. Explore the prison on either the ‘Doing Time’ or ‘Great Escapes’ tour to learn about Western Australia’s convict history. See what life was like behind bars at the prison, which was in use from the 1850s to 1990s, including prisoner artwork, the chapel and cells. Plus, hear about escape attempts over the years. Great way to experience Fremantle and learn the history of the place. Can thoroughly recommend. Driver was very knowledgeable and friendly. Very interesting tour to see the beautiful and very nice city of Fremantle. Great hour spent in the Company of Phil our driver and guide. Saw all the sights of Freemantle and later visited world heritage site, the Fremantle prison.Even better news for us caught the first tram 9.45 and we were the only 2 on the entire journey.